It’s good to see that textiles in art have continued to flourish since the early pioneers liberated the use of cloth and fibre. I’ve been looking at several artists who’ve been working since the fifties and who continue to work today. Here are four of them who are keeping the momentum going, beginning with Olga de Amaral. Born in Bogota, Colombia in 1932, Olga de Amaral studied textile art and developed work that transformed two-dimensional textiles into sculptural works. Her techniques brilliantly integrate art, craft and design and incorporate the use of fibre, gesso and precious metals. Her commitment to ‘off stretcher’ works has great resonance with me as I generally choose not to stretch or ‘mount’ much of my work, wanting to keep a strong connection to the fact that it’s a textile. Amaral’s work is almost exclusively driven by her exploration of Colombian culture and her own identity, which she weaves together through the use of fibre. A large part of her production has been understandably concerned with gold, inspired by the inter-woven histories of pre-Hispanic and Colonial art. Gold gives her work a sensual, rich and ancient quality, radiating a shimmering light and illuminating the viewer; I love it and having had to be satisfied with photographic images, I then had the privilege to see some pieces when visiting Colombia a few years ago. 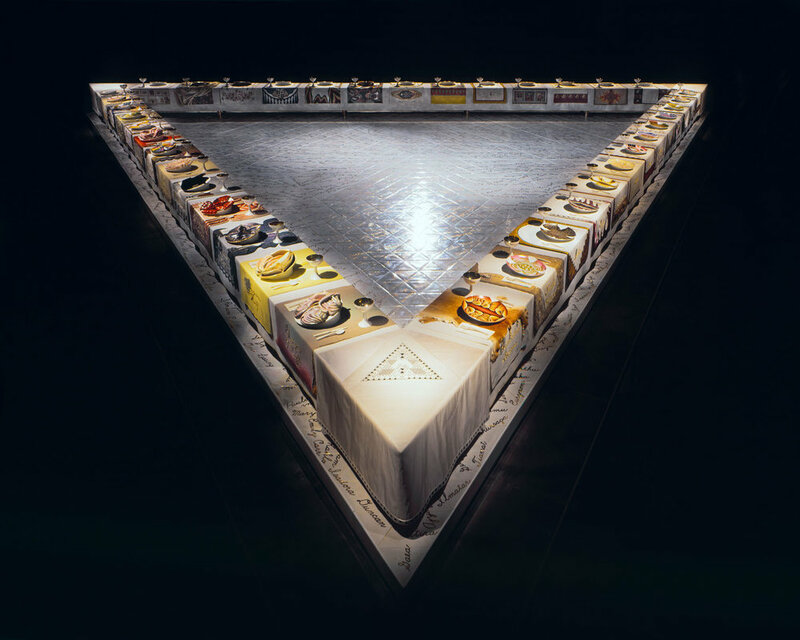 Born 1939, Judy Chicago is widely regarded as the founder of ‘feminist art’ on a wider scale. Her art installation The Dinner Party, was one of the first acclaimed art pieces to include needlework and fabric, representing a symbolic history of women in Western civilization. From 1980 to 1985, having observed an absence of iconography about the subject of birth in Western art, Chicago worked on the Birth Project. She designed a series of birth and creation images for needlework that were executed under her supervision by 150 skilled needleworkers around the country. Her more recent projects – all large-scale and collaborative - include PowerPlay, about gender politics and Holocaust Project: From Darkness Into Light, a tapestry designed by Chicago and executed by skilled artisans as part of a body of work that included painting, photography and stained glass. It explores her Jewish roots and involved eight years of enquiry, travel, study, and creation. In 2015/2016 in Bilbao and Bordeaux, the feminist curator Xabier Arakistain mounted the exhibition Why Not Judy Chicago?, an overview of Chicago’s career and an enquiry into ongoing institutional resistance to Chicago’s work. For over five decades, Chicago has remained steadfast in her commitment to the power of art as a vehicle for intellectual transformation, social change and women’s rights; an influential figure indeed. When I first encountered the work of Sheila Hicks, I was blown away. Playful, explorative and seemingly without limits, Hicks is an artist whose woven and textile works blur the boundary between painting and sculpture. Hicks’s artistic awareness began with her mother, who introduced her to sewing; her grandmother who showed her how to embroider and knit; and her great Aunt, who taught her how to paint. As a result, Hicks claims she was always ‘thread conscious’. Hicks is recognised as a weaver and her works are abstractions constructed of colour, usually but not always beginning with a single line, which is typically a strand of yarn or fibre. They can be two or three dimensional, small and intimate or large at a grand architectural scale. In fact, if you were to be exposed to certain pieces without seeing others, it would be initially hard to think ‘weaver’. Her sculptural work is often based on the idea of a ‘bundle’, which she often called ‘ponytails’, stacking or hanging them as in The Evolving Tapestry: He/She and the many versions of Banisteriopsis, which spanned a period from 1965-66 to 1994. Hicks also masses “variegated fibrous lengths”, inspired by the strands or bundles of plaited and knotted warp ends; she has twisted long skeins of linen and flax; focused on the constructed grid of textiles and deconstructed them in works such as Labyrinth by magnifying a weave to a colossal size in which the negative forms of the square were emphasised. Her practice exists in museums and galleries, showrooms and design showcases as her explorations have encompassed art, design, craft and manufactured textiles. A truly inspiring individual who “became determined to make art and to live in an atmosphere in which art can be produced”. Bravo. Lucienne Day, who died at the splendid age of 93, was the foremost British textile designer of her period. Her furnishing fabrics hung in every contemporary living room in Britain. Day drew on the English tradition of patterns based on plant forms, taking motifs drawn from nature – flowers, grasses, shoots, twigs - transforming them into something fresh, simple and most importantly, ‘modern’. Her work formed part of what she later described as a "tremendous surge of vitality" after the war and it was the design Calyx, that brought her real fame. Exhibited at the Festival of Britain in 1951, a large expanse of it hung in the contemporary dining room designed by her husband, Robin, at the Homes and Gardens pavilion. Many of Day's printed fabrics were made in long production runs, which kept the price affordable and it pleased her to think that people who couldn’t afford to buy a painting for their living room could at least own a pair of abstract patterned curtains. But, it’s not really her printed textiles that caused me to include Day in this lineup. In the 1970s, Day chose to make a transition from industrial design to craft – a risky decision even now. John Lewis had commissioned her to design a set of five shutter doors for their store in Newcastle and on seeing the designs, an architect friend assumed they were for an embroidery. Day's "silk mosaic tapestries” evolved from there. They were made in a technique developed from traditional patchwork – and it’s interesting that she referred to them as ‘mosaics’ rather than patchwork – perhaps the stigma of ‘patchwork’ existed even then! Formed of abstract patterns built up with tiny pieces of shot silk - often as small as one centimetre square – these mosaics glow and shimmer with light. Long live mosaics, long live patchwork!